Hi, I am interested in your 1957 Chevrolet 150 (stock #1312-NSH) listed on Autotrader for $47,995. I'd like to get more information about this vehicle and confirm its availability. You may not be able to put your finger on it at first, but you can tell that there is something special about this car. Its got a slightly different look to it. Its neater and cleaner looking than the usual 57. And thats because the 150s were built that way. In addition to that, there were fewer of them made too. 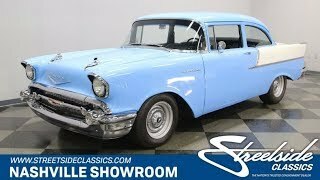 So, if you like the look, and you like the idea of driving something a little bit different, then check out this sweet 57 Chevy. A couple small differences add up to a significantly different look. You can think about it as the bling delete option. The effect is striking, especially in this beautiful shade of light blue. It coats the roof and sides of the car without a bunch of extra chrome getting in the way of the graceful body lines, and it really lets you notice the aggressive rake to the chassis. It picks up the two tone in white on the back fenders and trunk with simple lines of chrome tracing the dividing line and gracing the tops of the fins. Its definitely of case where less is actually more. The front of the car has no shortage of chrome though. There are rockets on top of the hood and Chevrolet in script on the front of it with a red, white and blue bowtie badge surrounded by a ton of 57 chrome grill beneath it. At the back, the chrome cascades off the top of the fins surrounding the taillights and runs across between them in a simple, clean bumper. Open the door and the theme continues with the simple and elegant Black interior. The door panel is dramatic in its simplicity and its a good thing the door handle is shiny or you might not be able to see it in the dark. The front bucket seats spice things up a bit with a Black and White pattern to the seating surfaces with Black leather side bolsters offering some nice support. The steering wheel is a three-spoke, brushed metal unit mounted on a tilt column with a bowtie center button. Behind it is a custom dash in black and silver with aftermarket gauges tucked back in their round pods. The ventilation controls are mounted in the stock location and include those for the air conditioning system with the vents under the dash. A short throw shifter for the 4-speed manual transmission rises from the center console topped by a white shift knob. For an extra treat, pop the trunk and check out the custom work in white back there. Pop the hood and you will find a 350 cubic inch motor nestled down in a neat and clean engine bay. The firewall is polished up as nicely as the outside of the car and really compliments the black, aluminum and orange of the engine. The gloss black air filter assembly sits on top of a Holley 4-barrel carburetor which feeds an Edelbrock performer intake manifold. Orange valve covers have Chevrolet in script and the A/C compressor as well as the alternator are perched up high in the front. Stock exhaust manifolds get the spent gasses heading back to dual free flow mufflers and a BeCool aluminum radiator with dual electric fans keeps things running cool. There are fresh belts and hoses as well as plugs, cap and wires, and a CPP steering box provides precise handling. Power flows back through that 4-speed manual trans to a rear axle fitted with a 3.73 posi gearset. 4-wheel disc brakes have great stopping power and the rubber meets the road through 235/60R15s in the back and 205/70R15s in the front mounted on steel wheels with Chevy hub caps. A classic 57 Chevy with an unusually clean look. Come on down and check it out.